I finally have some progress to report, after a couple of months’ hiatus. I’ve been wracking my brain, trying to work out a way to improve my vacuum system on the plane, but have had very limited success to date. I just can’t see a way past the current stalemate, brought about by the unusual shape of the dust outlet on the tool. I have sinking feeling that I’m going to have to go the whole hog and mould something out of resin. But what I have done is bought in the fins and plugs for Tom’s juevo grande. 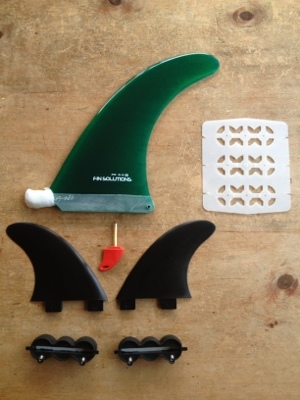 I got everything I need (except for the finbox) from the Oz Fin Company – see link to the right. The box, along with some more glass and a couple of other things, are coming in from Shapers Aust – link also to the right.